Writing a scrip is hard work: Whether you’re an industry professional or just an amateur with a dream and a plot, getting the format and presentation of your masterpiece right is a nightmare. Thankfully, we no longer live in the day of the typewriter, and apps like Celtx Script for iPhone and iPad are here to help. The app is a full-featured script writing and editing utility, offering formats for everything from film to graphic novels. It’s a great way to work on the go, and with wireless Celtx Syncing between the mobile and desktop versions of the software, you’ll never be without your rough draft. Celtx’s features are simplistic, though top-notch. The app is more or less a text-editor, but with the all-important formatting options. 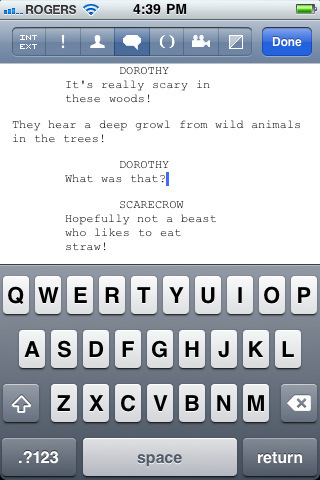 As the user types, the app automatically predicts what part of the script you want next. If you add a line break after a character tag, for example, Celtx formats the next portion of text as dialog. For the most part, this works wonderfully. However, I did encounter the occasional error, especially when writing film scripts. If Celtx picked the wrong part of the script (say an action sequence instead of description) the entire formatting of that portion came out wonky. Usually this happened after editing already existing text. Even when corrected, though, spacing would sometimes disappear and could not be persuaded to reenter the picture. A fix for this is code-related, and thus hard to peg. However, performance has improved over the last few updates, and I can only assume typing will improve even more in the future. In my experience, element transitions did match up perfectly, as advertised, between the desktop and mobile versions of Celtx. In fact, the syncing process overall is near flawless. The app makes use of a push-style sync, though, in comparison to a smooth replace-with-every-edit Evernote connectivity. This means you’ll have to “send” a script to your computer after every change, and vice-versa from your computer. Often, I forgot to to do so, leaving the latest version of a script out of reach once I was away from the computer. However, as with the app’s typing, future updates to Celtx’ servers could easily improve this. The app’s layout is absolutely gorgeous on both the iPhone and the iPad. Obviously there’s more real estate to type on the iPad, but the developers did a great job making features readily accessible on the iPhone’s cramped screen. Tabbed elements browsing is particularly helpful. However, there’s no support yet for desktop extras like comments or notecards—a sometimes vital plot device for any writer. 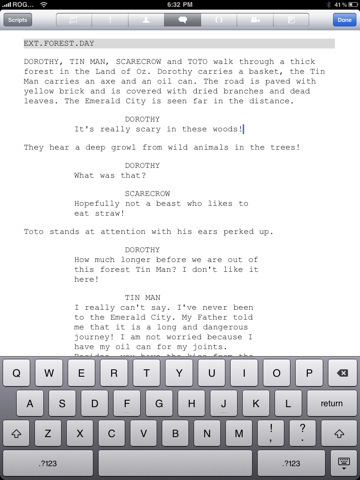 Celtx Universal App is a brilliant utility for any scriptwriter. It offers clean and efficient formatting on the go, and at a bargain price ($4.99 in the AppStore). Celtx is a great example of apps simplifying creative life, and if you’re screenwriter, you owe it to yourself to give the app a test drive. AppSafari review of Celtx Script was written by Luke Patrick on June 27th, 2011 and categorized under App Store, Files, iPad apps, Notes, Productivity, Reading, Universal. Page viewed 6847 times, 3 so far today. Need help on using these apps? Please read the Help Page.